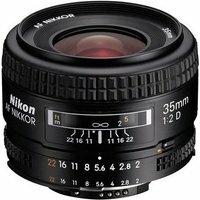 The Nikon 35mm f2 D AF is a wideangle Nikkor lens, ideal for a broad range of uses and environments. The Nikon 35mm f2 is well suited to travel and candid photography due to it's compact dimensions and light weight. On a DX Nikon camera the focal length is equivalent to 52.5mm (in full-frame 35mm film terms). For film and FX-sensor cameras the focal length is 35mm and the picture angle is 62°.